Ideas differ widely, of course, as to the most suitable type of car for touring. Many enthusiastic motorists who have toured thousands of miles prefer to drive in a light high-powered runabout of the style that has leaped into sudden popularity within a year. A strictly limited amount of baggage can be stowed away on the rear deck in a leather waterproof bag or in a steamer trunk strapped on the deck, and a rubber poncho can be carried for protection against rain. With powerful headlights for night driving, and a good blanket for sleeping out at night, if necessary, one can drive for days through the roughest country in remote mountain regions. He will, however, enjoy a sort of selfish pleasure, for at most he can carry only one friend and a mechanic, as the car has only one regular double seat, which is supplemented by a folding rumble seat behind that offers nothing in the way of comfort on a hard day's jaunt. The majority of tourists prefer the regular touring car, with side' entrance body, having comfortable seating accommodations for five or seven persons. In such a car, properly fitted out for the purpose, a whole family may travel for weeks almost as luxuriously as in a Pullman railroad car, regardless of weather. The question of suitable equipment for touring is one that requires considerable thought. It is possible to spend many hundreds of dollars for all sorts of fittings. Some of these are'- almost indispensable to comfort and satisfaction on the road, while others only serve to encumber the machine unnecessarily. Although each device may really serve a useful purpose, it should be remembered that, as in traveling by other means or when camping, the less paraphernalia one has to bother with, the greater is his ease of mind and his consequent enjoyment. Too often we pack along on a trip or vacation a bothersome quantity of stuff, much of which is never used. On the other hand, if we confine ourselves to the things that are really essential, we are likely to be surprised by the small amount of baggage that we have to take. Conceding that the automobile tourist desires simply to fit up his car with the attachments and devices that will add to the utility of the machine and to the comfort and safety of the passengers, there are certain things which it will be absolutely necessary for him to have. A comfortable Cape top and glass front are indispensable. In buying a Cape top one should also get a waterproof protector, to be slipped over the top when it is thrown back. This will keep the dirt and dust out of the lining and prove a profitable investment. The machine should be fitted with a set of good shock absorbers, to protect the springs from breakage when traveling over rough country and also for the purpose of adding to the comfort of the occupants. A dashboard speedometer-odometer is another necessity when touring. Driving directions in many route books simply give the measured distances between prominent landmarks in sparsely-settled country. For example, the book might read: "After passing large red farm house on left continue straight ahead a mile and a half and keep to right at fork in road." It will be seen that it is absolutely necessary to know when that mile and a half has been passed, and the odometer is the only instrument that will accurately give this information. The speedometer part of the combination is useful in view of the fact that speed ordinances and restrictions are becoming more severe every year, and when one is riding in an auto there is nothing more deceptive than speed. Even experienced men who have driven many thousands of miles are unable accurately to guess the speed at which a car is running, and five or ten miles an hour out of the way is no uncommon error. The speedometer will not cost much more than the fines a country justice may impose, to say nothing of the trouble and delay occasioned by arrest. Besides this. 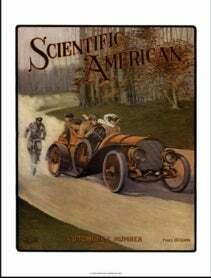 there is a great deal of truth in the statement, "It's nice to know how fast you go," and it is often fascinating to see the little needle on the instrument move up the scale as the car speeds steadily on under advanced spark and heavier charges of gas. When touring it is well to carry two new reserve tire shoes. When front and rear wheels are of different sizes, there should be one spare for each pair 1f tires. The new fiat treads are recommended for the rear wheels, but not for the front, as they make steering rather difficult. Extra tires should be covered with waterproof and lightproof casings, as rubber deteriorates when exposed to the light. It is advisable to carry at least two rear inner tubes and one front tube; when touring myself I invariably carry four rear tubes and two front tubes, having experienced as many as five punctures in a single day. Tire troubles are due to various causes, and it is well to be prepared for them. A pigskin repair cover will be found valuable in temporarily fixing a blown-out casing. In the event of a puncture it is advisable to insert a new inner tube rather than to repair an old one, as it is almost impossible to make a satisfactory repair job on the road. Inner tubes for use in rear shoes should never be repaired with rubber patches cemented on. The heat caused by road friction melts these patches off. The only sure way is to have the tube vulcanized. Inner tubes should not be car-. ried loose in a storage box, but should be put up in separate bags liberally sprinkled with French chalk, in order that they may not become chafed and so be rendered unfit for use. An experienced tourist is not ready to start until the car is equipped with a full set of tools, extra valves, valve springs, spark plugs, and such small moving parts of the engine as are likely to wear quickly or break easily. Of course, this list will differ with each make of car. In machines that are chain driven, extra links of chain are carried in the toolbox. A jack, tire tools, and full tire repair kit are, of course, essential. In mountain touring it is necessary to have non-skid chains, which must be used when coming down long hills slippery with mud after a heavy rain. The car, unless equipped with these, may skid and become unmanageable. In the early days rope was tied around the rear wheels to give them traction, but the newer and more serviceable tire chains or non-skid treads have taken its place and made driving on slippery asphalt or "greasy" country roads much safer. Protection of the car and its occupants from mud and water has been looked after mostly by the manufacturer before the car left the fattory. Cape tops and folding glass fronts do much to keep the car dry and comfortable in rainy weather. The machinery is also 'protected from mud and water by metal casings. It is advisable, however, to have mackintosh covers for the lamps when touring, so as to avoid the need of continual cleaning and polishing, and if the magneto is under the bonnet where rain may possibly reach the connections, they should be protected with a rubber arrangement suitable for that purpose. Many manufacturers neglect to furnish this, and as a consequence their cars have been stalled in wet weather by water getting into the magneto and short-circuiting it. The greatest care should be taken to keep water away from all the electrical parts of the machine. It is possible, of course, to make a tent part of the equipment, but this will scarcely be used unless the party intends to camp out for the night. The automobile of to-day has such a wide radius of action by reason of its high speed that this is seldom necessary, as it is nearly always possible to reach a town or large city by night. It is best to have the car equipped with good headlights and a reliable generator or as tank, as it sometimes becomes necessary to do night riding in a strange country. Even with good lamps it is never safe to drive faster than twenty miles an hour at night on roads with which one Is not familiar, as danger can arise in an instant. The machine should always be kept under perfect control ; half of the accidents that occur are due to careless driving. Among the miscellaneous items that are needed and which come in very handy are a collapsible gasoline bucket with chamois strainer, collapsible water bucket, ammeter and voltmeter for testing the batteries, small electric flashlight to examine the car at night in the event of accident, and a dash clock. Most cars of to-day have plenty of carrying and storage room. The extra tires are usually strapped to the running board with special holders. Inner tubes may be stored in the space under the rear seats. Extra boxes on the running board will provide a place for carrying tools, while a metal trunk rack fitted with leather auto trunks, that are dustproof and waterproof, will serve for baggage. The modern touring car, properly equipped, is capable of railroad speed and will take a party safely across country, up hill and down, in rain or shine, with more pleasure' than can be derived from any other method of transportation. The man who owns his automobile has his private car as luxurious as a Pullman, with all the roads of the country as his right of way and no schedule other than that fixed by his own fancy and convenience. The writer has always found it preferable to lay out the route intended to be followed. He has also found it a convenient practice to have a leather case made with a celluloid front in which the road directions can be placed. The map or directions can be read through the celluloid, which, however, protects them in case of rain. The easiest way to get along when asking road directions of natives in various towns is to know the name of the next following town and then ask the best road to it, if the road book directions are not explicit. For instance, before starting on a trip I generally take a map of the country through which I am going to travel and ascertain the various small towns through which I have to pass. These are listed, and as I proceed I inquire the way from one to. another. This method has been found satisfactory, for when one asks the road directions to the larger cities, which may be ten, twenty, or more miles apart, it is difficult to find anyone who can direct you properly, but any boy or girl can tell you the best road to the next town, which will probably be from three to five miles away. Having selected a route that you wish to travel, it is well to make out a time schedule and try to follow it, making due allowance in advance for delays en route and for the time that will be spent in viewing the scenery and points of interest. You may have a 50-! ).orse-power car, capable of a mile a minute speed, but if you are going to use the car for touring and expect to get any pleasure out of the tour, it would be better to have the machine geared down to forty miles an hour, so that it will httve additional hill-climbing power. It is not the car that can go fastest on the level that can cover the greatest distance in a day, but rather the machine that is consistent in its performance and keeps "plugging" along, up hill and down, hour in and hour out, and always drawing steadily toward its destination. The tourist who r e a 11 y wants to see the country through which he is passing and to enjoy a sensible r id e rather than a mad dash against time , would do well to plan his schedule on the basis of coverin g t went y miles an houror less, if he does not have a high-powered car. T his would be slow on the smooth, level roads, but where the country is rolling, an average of twenty miles an hour is a good one, and to maintain it the car will be going at twenty-five and even thirty miles at many places. Besides, twenty miles is the legal limit in most States. Connecticut's new law, however, abolishes the speed limit but makes arrest possible for reckless driving if one travels over twenty-five miles an hour. It is safe to presume that every motorist seeks to get as much pleasure and comfort out of touring as possible. The States of New York, New Jersey, Pennsyl vania, Connecticut, Rhode Island. Massachusetts, Vermont, New Hampshire, and Maine offer not only the most beautiful and varied scenery but the finest of roads. One particularly beautiful route which I have had the pleasure of taking leads from New York city up along the west side of the Hudson River to iNew-burg and Pine Hill, N. Y., and then to Binghamton, Bath, and Buffalo, whence last year's Glidden Tour route may be followed to Rochester, Syracuse, Utica, Albany, Saratoga, and Lake Champlain, N. Y. ; Three Rivers, Montreal, and Quebec, Canada; Jackman Maine; Rangeley Lakes, and then to Bretton _ Wood:; in the famous White Mountains of New Hampshire. The roads, with the exception of some stretches in Canada, are good. The return journey may be made by the way of Concord, N. H.; Boston, Worcester, and Springfield, Mass. ; then to Lenox in the Berkshire Hills, down through the beautiful Housatonic Valley, across to Poughkeepsie, and down along the east shore of the Hudson River to New York. This route can be considerably shortened and many bad roads avoided by following directly up the west side of the river from Newburg through Kingston, Albany, Schenectady, Saratoga, Glens Falls, Ticonderoga, and Plattsburg to Montreal. Taking a trip like this, which is one of the most attractive in point of scenic grandeur in the eastern United States, the itinerary can be laid out so that each day's run can be made easily and comfortably, allowing time for a noonday stop for luncheon, and confining the riding to daylight. The shorter trip could be made with ease in from two to three weeks, allowing plenty of opportunity to jog along easily. rest each Sunday, and enjoy the tour without hurry or bustle. Palimpsest Brasses. The reformation in England during the sixteenth century, and the wave of puritanism which followed. resulted in the destruction of much church furniture and ornamentin many cases amounting to complete plundering - or destruction of whatever was valuable. Among other things memorial brasses were often stripped from old tombs, and it has been thought that this was due to general dislike to the form of record. But lately a number of palimpsestor used overbrasses have been found in English churches, and their occurrence suggests that the destruction of old brasses did not follow religious scruples; but that the brass was taken up and sold, often to be turned over and the reverse side engraved in memory of some person recently burkd. As the brasses are usually engraved with an effigy of the deceased person, and cut to the shape of the engraving, it would not always be possible to alter an ancient memorial ; but often it could be done. A rarer form of adaptation was to use the brass without reversal, adapting the ancient effigy to the requirements of the time, crests or incongruous attire being cut away, and new details worked in to take their place. In splicing a wire rope experience has shown that the efficiency of a splice depends on itj length, the larger the rope the longer the splice required. In ordinary splicing of a %-inch rope, the length of the splice should not be less than 20 feet, for a 1-inch rope it should be 30 feet, and for rope over inches in diameter it should be 40 feet.